There are some ways in which you can’t get further apart than a Baptist and a Lutheran. The occasional joshing that David and I would get into highlighted those difference. I might mention a baptism coming up and David would scold me for child abuse of that poor baby who didn’t even know what was going on. I could return the favor to a smiling face about how heartless he was to let all those children go without the comfort of knowing God had claimed them in baptism. And we could do that chiding because our differences were swallowed up in something bigger. And we were blessed to see the living core of that faith in the past month – that something bigger that swallowed up the hard stuff. David was unafraid to talk about Jesus, and all the more about the resurrection. When the natural reaction would be to cry about the wrong-ness, David reminded us that life is the gift of its source, Jesus. And when the desired reaction is fear, because there is still one of our great enemies – death – that has not been fully put under Jesus’ feet…when we would fear, David would remind us to stop. I believe in the resurrection. Even death has been swallowed up in something bigger. The life and the resurrection of Jesus. And connected as we are by our baptisms – believers or otherwise – we are heirs along with David of that fulfillment. Thank you David for your witness. This text is one of the strangest in the Bible, but I think it might be one of the most important for churches that baptize babies to understand. 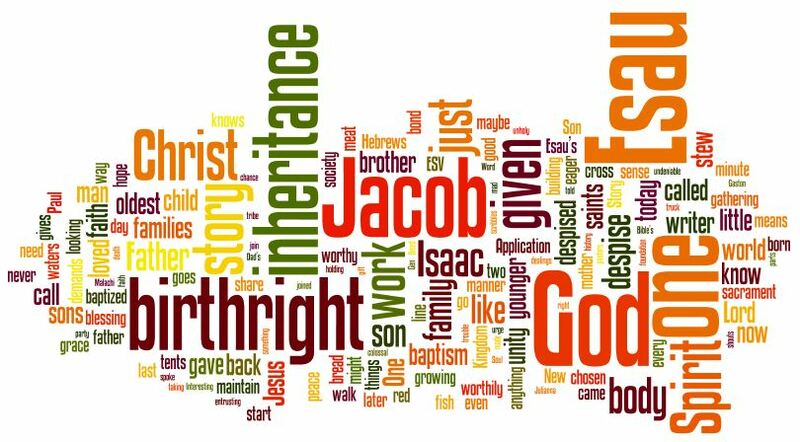 The sermon is a character study on Jacob. You can read the entire story yourself starting in Genesis 25:19ff, but the core of my take away is that Jacob came into the world a child of promise and proceeds to attempt to earn it or escape from it. And he continues in conflict…until he can’t. Alone, in the night, scared he’s losing it all…Jacob prays. And then Jacob wrestles through the night..until he gets his blessing. The blessing once taken from a blind Father by trickery is granted face to face. The blessing once traded for is accepted freely. The blessing that once came by grasping…is gained by letting go. And the name is changed. Not that those blessings were not true, they just were not claimed. They were not believed. But now, walking with a limp, no longer running. Israel no longer strives in conflict, but rests on the promise. We baptized a child today. In baptism that child is made an heir of the promise – Just like Jacob. The promise is true. It doesn’t matter what we do because baptism doesn’t depend upon us. But why this text is important, is because we can turn our back on that gift. To learn the lesson of Jacob is wrestle with the promise. To hold onto God and not let go until we have made the grace and the hope ours. The christian life, lived with a Lutheran accent, is about those wrestling matches where we receive as ours what God has already given. Where we learn to live by grace in hope, instead of conflict. Now most of that poem could be just about seeing landscape with different eyes. My Midwestern raised eyes used to staring at the unending distances, had to get used to the hills of the East. In the Midwest you stared at sky just by staring at the horizon. It was impossibly far away, but always present. In the east, the ground right in front of you often lifts your eyes. You don’t see that far away meeting, but instead jump from the top of the hill right into the blue. It would be a nice poem if just about that, but read that last line of the third stanza. Our eyes often miss the reality. Whether that is because they are dim and clouded, or because we don’t want to see what is before us, our foreign eyes “are unable to conceive that these…were alive.” We have been placed where we are; to live, we should see. But that seeing requires work. And the poet takes it a step deeper in the last stanza. You can be born or be placed somewhere and never see anything else. And this is just what life is. If you’ve never known the monsoon, or even the gentle rain, the sparse landscape just is. You might never now, just how dry it is. Or how deep the dirt “wishes for water”. Think he is talking just about the landscape? A first baptism was by the flood for the cutting away of sin. A second baptism was by the sea and the cloud, because the cloud is a symbol of the Spirit, while the sea is a symbol of the water. A third baptism is that of the law, because every unclean person washed himself with water and also washed his garments and then entered the camp. A fourth baptism is that of John, which was an introductory baptism leading those thus baptized into repentance so that they might believe in Christ. “I indeed”, he says, “baptize you in water, but he that will come after me, he will baptize you in the Holy Spirit and fire.” John purified with water in advance to prepare for the Spirit. A fifth baptism is the Lord’s baptism with which He was baptized. He was not baptized because he needed purification. He was baptized so that so that by making my purification his own, he might “crush the heads of the dragons in the waters” (Psalm 74:13), wash away the sin and bury all of the old Adam in the water, sanctify the baptizer, fulfill the law, reveal the mystery of the Trinity and become for us a model and example for the reception of baptism. We also are baptize with the perfect baptism of the Lord, which is by water and the Spirit. 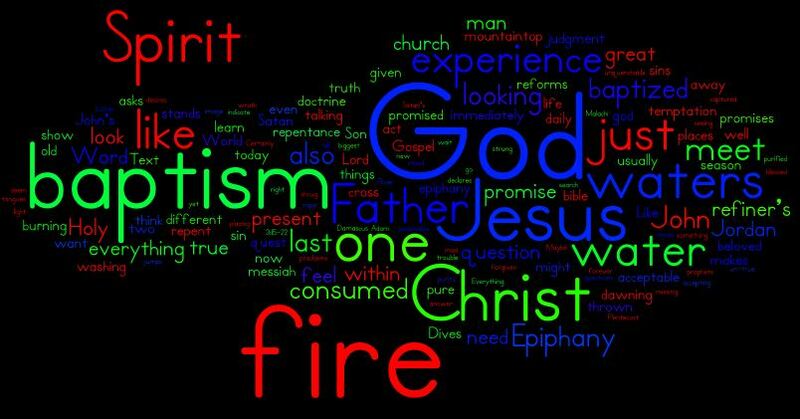 It is sad that Christ baptized in fire because he poured out the grace of the Spirit on the holy Apostles in the form of tongues of fire. 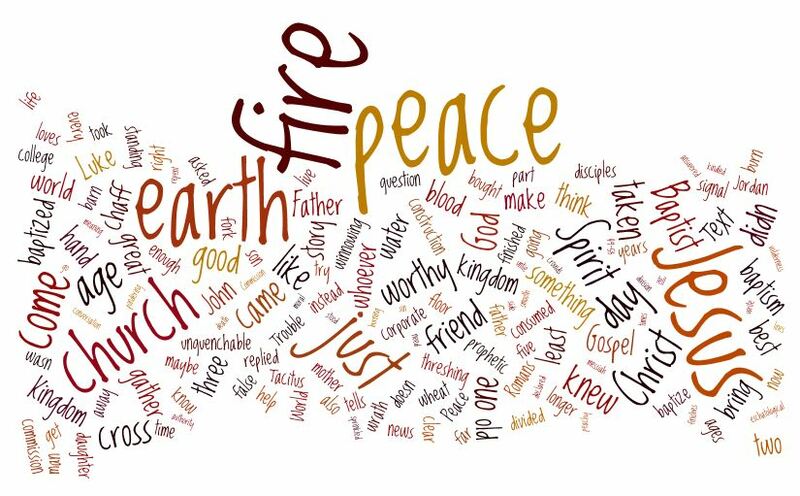 The Lord says, “John indeed baptize with water, but you will be baptized with the Holy Spirit and fire, not many days from now (Acts 1:5).” It may also be that he is said to baptize with fire because of the chastening baptism of the fire to come. A sixth baptism is that which is by repentance and tears, which is truly painful. A seventh baptism is that which is by blood and martyrdom. Christ was also baptized with this for our sake. This baptism is exceedingly sublime and blessed because second stains do not pollute it. An eighth baptism, which is the last, is not saving. While being destructive of evil, since evil and sin no longer hold power, it chastises endlessly. It is nice to see someone beside Luther and the reformers point to repentance as baptism. Even though he mentions it earlier as the chastening baptism of the fire to come, that is what I take the “eighth baptism” to be – the final fire where the current heaven on earth pass away with all not washed by the earlier baptisms. A great bit of biblical theology and reading of the divine plan of salvation. 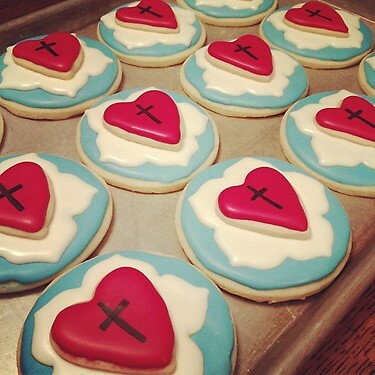 I wish I could say I made those cookies, but I stole the picture from instagram. Now there is a hard-core Lutheran. Baby Linley mentioned in the sermon is the grand-daughter of my A/V support, so the podcast version might be a little later. There is something deeply fitting about having a baptism on Reformation Day. Baptism is of course shared by the entire church, but each tradition chooses to emphasize a different understanding. And that actually gets to the core of this sermon. I hoped to present a uniquely Lutheran understanding of the Gospel. And to truly do that you need to consider baptism. Objectively in baptism God has made you part of the family. Its His baptism. Its his word and promise and work. Through his work you belong. Subjectively it comes by faith. It’s true, but you need to make it your own. You have to believe it. And then you become it. As Luther says about baptism in the catechism, “the old Adam in us should by daily contrition and repentance be drowned…and the new man should daily emerge and arise to live before God”. We daily live out our baptism. We are daily becoming more like Christ. A Lutheran understanding of the gospel is a meditation on baptism. 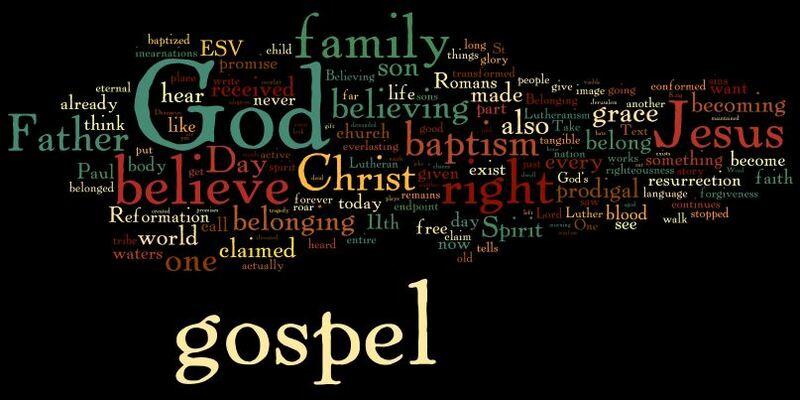 For me the fullness of the gospel is best expressed by the Lutheran understanding. Everything else either adds something (Jesus and ______) or subtracts something (Sacraments just signs or just spiritual). That is why Reformation Day gets its observation. It is a yearly call to live our Christian Freedom bestowed in baptism. A call not to be conformed to the world, but to be transformed by Christ. The US has a famous list of birthrights: all men are created equal and endowed by their creator with certain unalienable rights. Among these rights are life, liberty and the pursuit of happiness. This sermon is not about those, but we as a people might talk about rights, but we rarely talk about either where they came from or how. The most precious ones are grants. And even more precious are the ones backed by the divine account. Governments may say that we have certain rights, but if the government gives it can also take away. Hence even Jefferson – extreme deist at best – rooting life, liberty and pursuit in a creator. But turn from the political realm for a second. Salvation has come to us as a birthright. Baptism now saves you (1 Pet 3:21). The Christian has been born of water and the spirit (John 3:5). There is one body and One Spirit, one lord, one faith, one baptism, and one God and Father of all (Eph 4:5-6). That is the good news. God so loved the world that he gave his only son. Salvation, forgiveness of sins, is our birthright in Christ. And nothing external, not even the devil himself, can take it from us. The sermon recounts two biblical stories: Jacob and Esau and the Prodigal Son. Two stories of Fathers and Sons. Two stories of despising the birthright. That is the only way we lose our inheritance – to despise it. The American Founders were wise people. They understood this also. They lived in a society that was schooled by the church’s teaching. Even the deists and Harvard Unitarians quoted and studied scripture. Asked of Franklin: What kind of government have we? A republic, if you can keep it. Also Jefferson’s quotes about the tree of liberty and blood. Our tendency is to despise things that we have been granted. They knew it in the political realm. How much greater in the spiritual? So Paul starts with an exhortation – “I a prisoner of the Lord urge you to walk in a manner worthy of your calling (Eph 4:1).” Don’t despise your birthright.